Urban Identity is the second in the successful Learning from Place series that draws upon the wealth of experience in the Academy of Urbanism. This edition deals with the subject of urban identity and character. Why is it that all modern towns and cities look the same, as they become dominated by identikit buildings, multi-national corporations, even arbitrarily imposed urban design rules? How can we preserve and foster the sense of local identity and character that so value without falling into the trap of historical pastiche?Four leading urban thinkers take this theme as the staring point for chapters on urban identity. The classical architect Robert Adam delivers a broadside to modern architecture that he sees as the multi-national face of globalism. The architect and academic John Worthington ponders the difference between how a place is seen, its identity and how it wants to be seen, its brand. While the architects Anthony Reddy from Ireland and Frank Walker from Scotland explore the notion of local and national identity in architecture and design. These chapters are interspersed with five chapters by leading practitioners inspired by the shortlisted places for the Academy's second annual awards. The surveyor Chris Balch revels in the life of three great European cities while Brian Evans, Chris Brett celebrate three towns that are really great small cities. David Rudlin looks at three creative quarters and what they contribute to the economic and social life of their host cities while Frank McDonald takes us on a journey down three great streets and David Taylor and Anthony Alexander applaud three urban places created created and improved in recent years. 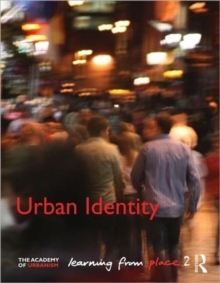 Like the first book in this series, Urban Identity brims with fascinating and sometimes controversial insights and opinions on urbanism. Illustrated again by the drawings of David (Harry) Harrison and poems by Ian MacMillan and packed with photographs and plans of the places visited by the Academy as part of their awards scheme.